Located in the exclusive area of Sandy Beach on the beautiful Sea of Cortez, the Sonoran Resorts Family boasts 4 luxury oceanfront resorts. The Sonoran Spa, Sea, Sun and Sky offer true unobstructed oceanfront views of the Sea from every condo. Our resort amenities are among the very best anywhere. 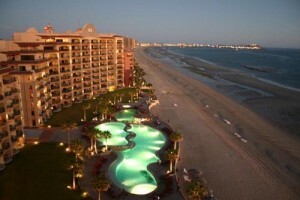 Visit us just once and you will be a lifelong fan of Puerto Penasco and the Sonoran Resorts. Full Ownership, Oceanfront Luxury has never been easier. The developers have a limited number of brand new condos remaining and are offering some unbelievable closeout incentives. We also offer a very good selection of luxury resale condos at each resort. Puerto Penasco is one of Mexico’s fastest growing resort towns. Many have compared us to Cancun or Cabo in their early days. Today’s prices are the best in years and there has never been a better time to invest. Sonoran Resorts, Puerto Penasco, Mexico. Owning in Paradise is easier than you think. Sonoran Sun Resort is an icon in luxury beachfront and ocean view Rocky Point condos. You will enjoy the beach front swimming pools, Jacuzzis and scrumptious restaurant on site. Exercise in the state-of-the-art fitness center or play a game on the private tennis court. Resort guests can also schedule fishing trips or a sunset dinner cruise, rent kayaks and boogie boards, and so much more. The second development was “Sonoran Sea Resort”, which consists of two condominium towers of 228 condominiums. Completed in 2004, it has 1, 2, 3 and 4 bedroom condos, free high speed Internet, 3 front beach swimming pools, one is heated during the Winter months, aqua bar, garage/storage units, family and adult Jacuzzis, snack shack, convenience store, Martini’s by the Sea Restaurant, charcoal BBQ grills available, complete fitness center and tennis court, children’s playground, 24 hour security and much more. All with an ocean view covered terrace. Furnishings vary, including number/size of beds, TVs, VCRs and DVDs. Fully equipped kitchens including dishes, cookware and utensils. Each condo has a washer and dryer. Bath, bed and kitchen linens are provided. The first venture, the Sonoran Spa, proved successful. The construction of oceanfront condos created unobstructed, breathtaking views on Sandy Beach. The Sonoran Spa consists of 1, 2, and 3 bedroom condos with front sea balcony, garage/storage units, La Spa, a full-service world class spa, convenience store, the Sonoran Grill Restaurant, on-site management company, 24-hour security, tennis courts, complete fitness center with state-of-the-art equipment, Internet center, high speed wireless Internet signal, three swimming pools, children playground, water slide for kids, public BBQ grills, family and adult Jacuzzis. All of them with an ocean view covered terrace. Furnishings vary, including number/size of beds, TVs, VCRs and DVDs. Fully equipped kitchens including dishes, cookware and utensils. Each condo has a washer and dryer. Bath, bed and kitchen linens are provided.